Launched from Kourou, French Guiana on 10 December 1999, the European Space Agency's X-ray Multi-Mirror satellite XMM-Newton is the most powerful X-ray telescope ever placed in orbit. The mission is helping to solve many cosmic mysteries, ranging from enigmatic black holes to the formation of galaxies. Many celestial objects generate X-rays in extremely violent processes. But Earth's atmosphere blocks out these X-rays, messengers of what occurred in the distant past when stars were born or died, and clues to our future. Only by placing X-ray detectors in space can such sources be detected, pinpointed and studied in detail. 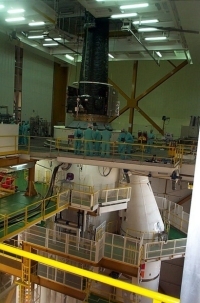 XMM-Newton, the largest science satellite ever built in Europe, has an unprecedented sensitivity. XMM-Newton carries three very advanced X-ray telescopes. They each contain a mirror module with 58 high-precision concentric mirrors, delicately nested to offer the largest collecting area possible to catch the elusive X-rays. These mirror modules allow XMM-Newton to detect millions of sources, far more than any previous X-ray mission. The satellite follows a highly eccentric orbit, travelling out to nearly one third of the distance to the Moon; this enables astronomers to make very long and uninterrupted observations. Peering into deep space, XMM-Newton's science payload is considerably increasing our knowledge of very hot objects created when the Universe was very young. XMM-Newton is the second of ESA's four 'Cornerstone' missions defined in the Horizon 2000 Programme. Development and construction of the spacecraft overcame major technological hurdles. Its wafer-thin X-ray mirrors are an extraordinary feat of engineering and the smoothest ever built. With its five X-ray imaging cameras and spectrographs, and its optical monitoring telescope, the space observatory is at the cutting edge of astronomy.